WWE TLC 2016 is going to take place tonight. The TCL results have been updated with live updates and winners. The 2016 TCL live stream information is given below. Later on, the fans can check the highlights. Until the PPV matches start, follow our preview and result predictions below. After the brand split, WWE SmackDown Live has come with its exclusive pay-per-view (PPV) event on this Sunday. It is titled TLC: Tables, Ladders, & Chairs. It seems to be the answer of Hell In A Cell of WWE Raw. Rumors say that it is the Elimination Chamber for the blue brand ahead of the Wrestlemania 33. Out of total six matches for TLC tonight, four are championship ones. Of the entire card, there is one match with a stipulation. As of now, there is no match announced for the kickoff show. The match card includes a tables match, a ladders match, a chairs match, and a traditional TLC match. The matches on the TLC card seems to be just the rehash of existing feuds of WWE Survivor Series 2016. Only one match is going to be different. It was done because there wasn’t sufficient time to build up new feuds. There was only two weeks gap between Survivor Series and TLC. So, it looks like that TLC will prove to be the culmination of some of the current feuds. Scroll and check out the preview and prediction along with the match card of the PPV. It doesn’t have any stipulation to it. It was made on the go-home SmackDown Live. As American Alpha had defeated the entire SmackDown Live roster on November 22, they should have been the number one contender. 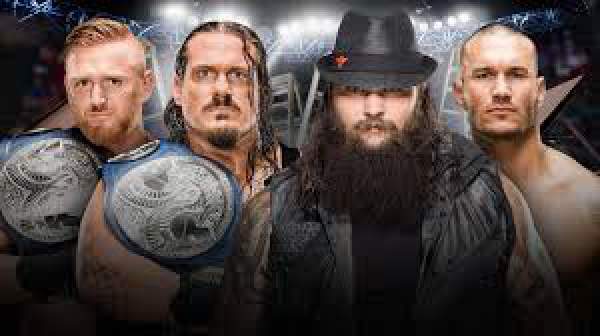 But, Bray Wyatt appeared along with Randy Orton and Luke Harper. Wyatt announced that they would have face them next week to get the title. Considering their strength and form, Ordon and Wyatt defeated them and got to become the Number One Contender. The feud started prior to SummerSlam 2016. However, the match couldn’t take place as Lucha Dragon suffered an injury. Thus, the storyline continued, and Kalisto injured Corbin. It got him a chance in the SmackDown Live team. Both of them assaulted each other and thus, a Chairs match was announced for them. It has been eight months since the arrival of Lone Wolf. It is the perfect opportunity for Corbin to defeat the underdog Kalisto. It has been the most attractive feud of the year. The brand split has resulted in the improvement of their performances. In-ring work and their characters have been developed to a great extent. Their match at the No Mercy was the instant classic as Ziggler had put his career on the line. He defied everything and everyone to win the Intercontinental Championship. Just after a month, he lost it again to The Miz. This increased the prestige of the Intercontinental Championship. This match may not be as thrilling as other for fans. There is an NO DQ match being advertised by the General Manager Daniel Bryan even before the No Mercy. Today’s match will end this incredibly entertaining feud. Nikki got better of Carmella in the last SmackDown Live show. Tonight, it is not going to be clean. Nattie may assist her giving birth to a new feud. Their feud started just after the Backlash when Becky became the inaugural champion. Two of them had a match at No Mercy, but Becky suffered an undisclosed injury. Thus, she couldn’t be back on the show for few weeks. Eventually, the match took place in a SmackDown episode where Becky got an extra edge. The referee couldn’t spot the Alexa Bliss’ feet on the ropes. It will be a tables match between them. The notable aspect of the feud includes the development of Bliss’ character and her skill on the mic. Let’s see who wins this time. One of the WWE MVPs of this year is AJ Styles without any second thought. Their feud is on since the end of August. It has been so long that it led Styles to win the title at Backlash via nefarious means. Since then, he hasn’t been able to defend the title cleanly. However, he has been the character with most momentum on the roster. Let’s see if the feud will come to an end this time or not. He has been playing the heel champion to perfection. With James Ellsworth going out of the picture, Dean Ambrose hasn’t left with anyone else’s support. It can be the match of the night. It is tagged as the traditional TLC match with Tables, Ladders, and Chairs to be destroyed without any limit. Feel free to share your predictions. Stay tuned. Don’t forget to share.